The Keep the Tennessee River Beautiful Board of Directors is pleased to announce Kathleen Gibi, who has long served as Public Affairs Specialist for the City of Knoxville, Tennessee, as its new Executive Director. Keep the Tennessee River Beautiful (KTNRB) is the first Keep America Beautiful affiliate in the nation to solely focus on a river. The non-profit has already rallied 703 volunteers to remove 55,655 pounds of trash from the river in its first three years, hosting cleanups in Tennessee, Alabama, Kentucky, and Mississippi. 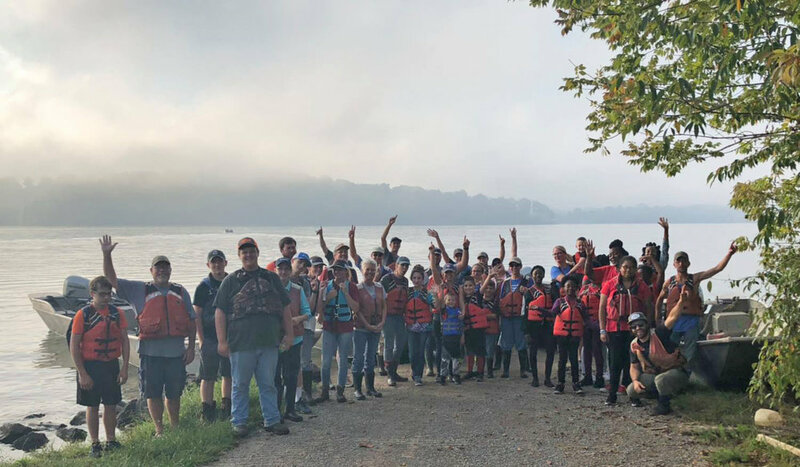 The KTNRB non-profit started shortly after Keep Tennessee Beautiful and the Tennessee Valley Authority sponsored Living Lands & Waters' Tennessee River Tour in 2015, which Gibi helped to conceptualize and implement. The tour stopped along six cities within three states as the Living Lands and Waters barge showcased trash removed from river cleanups along the way. KTNB and TVA wanted to continue the work of Living Lands & Waters and created Keep the Tennessee River Beautiful, working in communities along the river’s 652-mile stretch to preserve, improve, and protect the river for generations to come. Living Lands & Waters barge docked at Volunteer Landing in Knoxville, Tennessee during the 2015 Tennessee River Tour. Volunteers at a KTNRB cleanup held in October 2018. Gibi is following the organization’s original Executive Director, Laura Howard, who has led KTNRB since its inception and currently serves as Environment Health & Safety Manager/Recycling Coordinator at Sevier Solid Waste, Inc. Howard will continue to serve on the KTNRB Board of Directors. 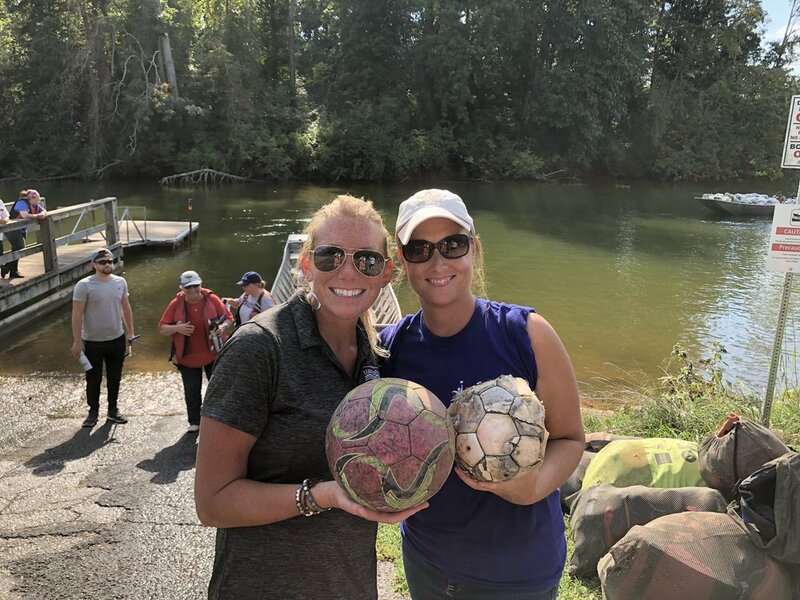 Laura Howard (left) and volunteer Lucretia Embry show off soccer ball treasures found in a KTNRB cleanup..
Gibi has served as Public Affairs Specialist at the City of Knoxville since 2004, first working in the Parks and Recreation Department under then Mayor (now Tennessee Governor) Bill Haslam and then moving to the Communications Department under Mayor Madeline Rogero. In 2015, the National League of Cities named Gibi as its Most Dedicated Staff Award recipient, a distinction she earned for her local collaborative efforts for First Lady Michelle Obama’s Let’s Move! Cities, Towns and Counties initiative (in which Knoxville and Knox County were ranked no. 1 in the nation). In her role with City of Knoxville Communications, Gibi has worked on communications for the Public Works Department, which included Parks and Recreation, Engineering, Public Service, Fleet Services, and Plans Review and Inspections. In Knoxville, she is responsible for initiating and organizing programs such as the Tennessee River Tour, the annual Father’s Day Fishing Event, the CrossKnox Race, and Neighborhoods to Nature. KTNRB currently holds four annual river cleanups with assistance from Living Lands & Waters. The organization also coordinates an Adopt-a-River-Mile program. For more information, visit www.KeepTNRiverBeautiful.org.